SEO is a complicated and time-consuming process. It includes different stages and requirements to be performed well. Once you’ve done with creating high-quality content on your blog, you start doing an On-page optimization. Then goes Off-page SEO. However, if you think that it would be enough for your website to rank in Google Top10, you are wrong! The final stage of the whole SEO of your website should be its technical aspect. Only professional SEO optimization will make your site run smoothly on the web. In this guide, I am going to cover 10 technical SEO tips that will help you improve your ranking in 2018. I would like to start with content hierarchy definition. Content hierarchy is the order in which the pages on the website are grouped. There are two main types of content hierarchy – ‘flat’ and ‘deep’ one. Now let’s have a look what each type of hierarchy means. Flat hierarchy enables to reach most pages in a few clicks. Deep hierarchy requires users to take more actions to get to the exact page they want. Now let’s see how each type of hierarchy influences the user’s experience. When content is not buried under multiple layers (flat hierarchy), it becomes more accessible for users. In contrast to this, deep hierarchy supposes that your content will be harder to find. Users don’t actually like this way. Deep hierarchy (that has only a few categories on each level) generalizes content that makes it inconvenient for users to deal with. Flat hierarchy offers users content that is split into different categories. It makes much easier to find the content you want. What do website owners want to see on their sites? They want to see that a user can get to any page of the site in a few clicks right from the home page. Sometimes it is necessary to ‘hide’ important pages of your website from Googlebot and other web crawlers. Who wants to see a bot that crawling the admin page? The answer is – nobody. Thus, the best way to keep your ‘sensitive’ content safe from spiders is blocking them with the help of robots.txt. Here a comprehensive guide on what robot.txt is and how to use it. ‘Non-www’ domain tends to be a “naked” domain that has no technical advantages. From the other hand, ‘www’ domain acts as a hostname, helps with DNS flexibility, and the ability to restrict cookies using multiple subdomains. Google states that the choice between ‘www’ domain and ‘non-www’ is up to a website owner. However, you should remember to do 301 redirect from the one you don’t use anymore. You can set up a preferred domain with the help of Google Search Console. I would like to start with a brief explanation of what 301 redirect is. 301 redirect is a permanent redirect from one URL to another. 301 redirects send website visitors and search engines to a different URL, not the one they originally typed into their browser or selected from a search engine results page. You could hear that 301 redirects might lose some ‘link juice’ but Google has already confirmed that these redirects pass full link value. So, keep an eye on the pages that might be lost or deleted. Use 301 redirects. For your reference, a rel=canonical element is an HTML element that helps avoid content duplication. In other words, it tells Google that similar URLs are the same. It is especially important to use the element for eCommerce websites where an option of filtering categories by different attributes can lead to creating multiple URLs with similar content. If you have never dealt with SSL certificates and you don’t know what I am talking about, let me provide you with an explanation. SSL certificates are small data files that digitally bind a cryptographic key to an organization’s details. They activate the padlock and the HTTP protocol allowing you to build secure connections from a web server to a browser. The primary purpose of SSL certificates is to protect your personal information on the website like passwords, usernames, etc. You can get a free SSL certificate using Let’s Encrypt. Content Delivery Network (CDN) is a system of distributed servers that deliver pages and other web content to a user, based on their geographic location, the origin of the web page and the content delivery server. In simple terms, CDN helps create cached copies of your website on different servers around the world. CDN speeds up your website and helps you save on bandwidth. If you use CDN, you can be sure that there will be no user around the globe who will have troubles with loading speed of content on your website. If you think that only an SEO specialist can help you with fixing all the errors on your website, you are wrong. Google can help you with this. 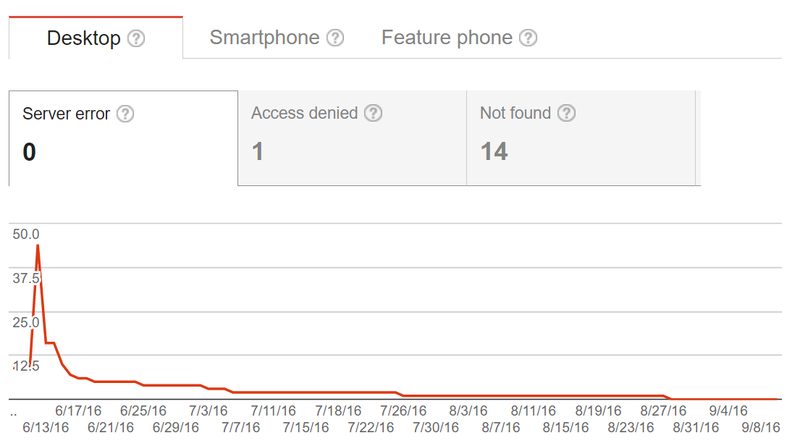 Go ahead and sign up to Google Search Console. What benefits can it give you? For example, check ‘Crawl Errors’ report to see any errors Google can find on your website. Use Google Search Console and fix every error you can find. Furthermore, ‘HTML Improvements’ report can give you useful recommendations regarding SEO for your site. This report provides insights into how many pages Google indexed for your website. Getting the report on your screen is super-easy. Just go to Google search and type site:yourdomain.com. You must know an approximate number of pages Google would index for you. If you see that the number is higher than you expected, thus there are some indexing issues you should fix. Don’t shy away from assisting Google. Make the process of crawling the pages on your site easier for it. And the best way to do the process of crawling smoother is via creating a sitemap. It is good to know that Google can easily crawl your website. But it is a way better to ‘ask’ Google to recrawl the pages on your site whenever you need. Do these 5 steps and the page you want will be crawled in a blink of an eye. I’ve started this post with the statement that a technical aspect of SEO is the last thing you should care about. Last but not least. These 10 tips will bring you closer to performing the biggest part of technical SEO elements correctly. If you have anything else to add to the list of the above tips, please, feel free to share your thoughts in the comments. Don’t forget to spare this article on your social media channels.